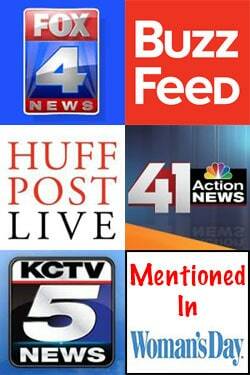 You are here: Home / Entertainment / Baseball Themed Party Ideas & More! 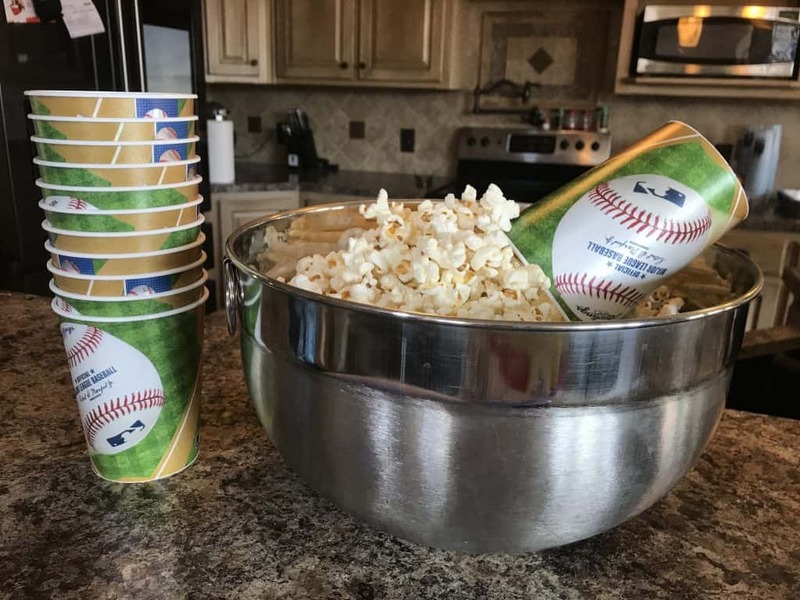 Baseball Themed Party Ideas & More! We decided to throw another themed party this year! We wanted one to celebrate the All-American sport, Baseball! 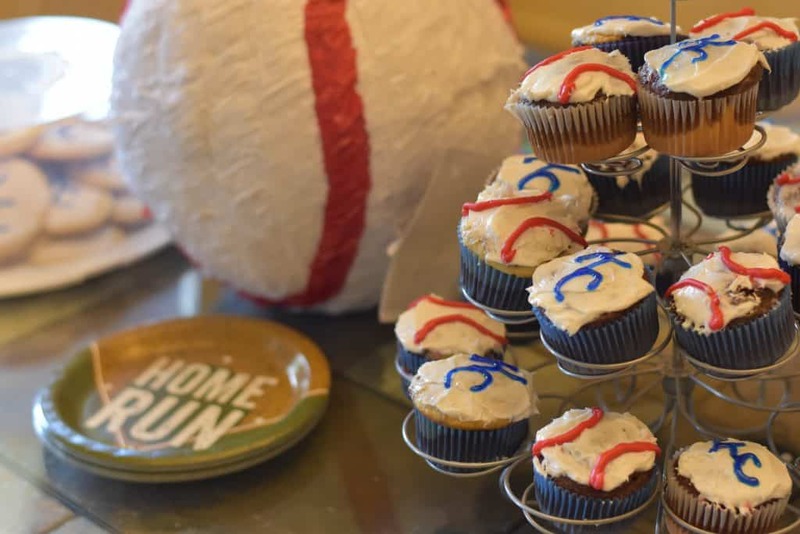 Our Baseball Themed Party was filled with Baseball Themed Food, The BEST Decorations, and even activities! We worked with Birthday In a Box and Any Promo this year for our themed party! Baseball is such a great sport and it has such a long season! Planning a party around the same time a game is going to be on TV makes for the perfect fun and entertainment! 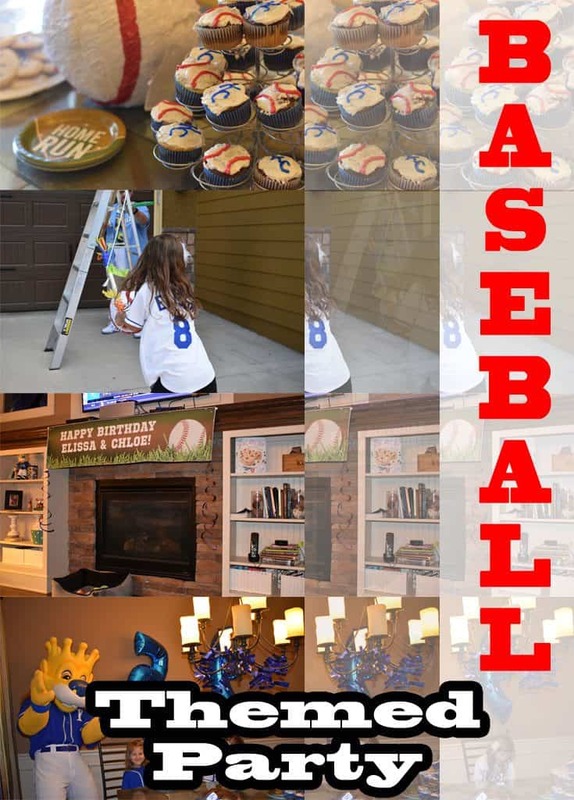 Our girls love Kansas City Baseball so incorporating their party with the theme was a lot of fun to do! 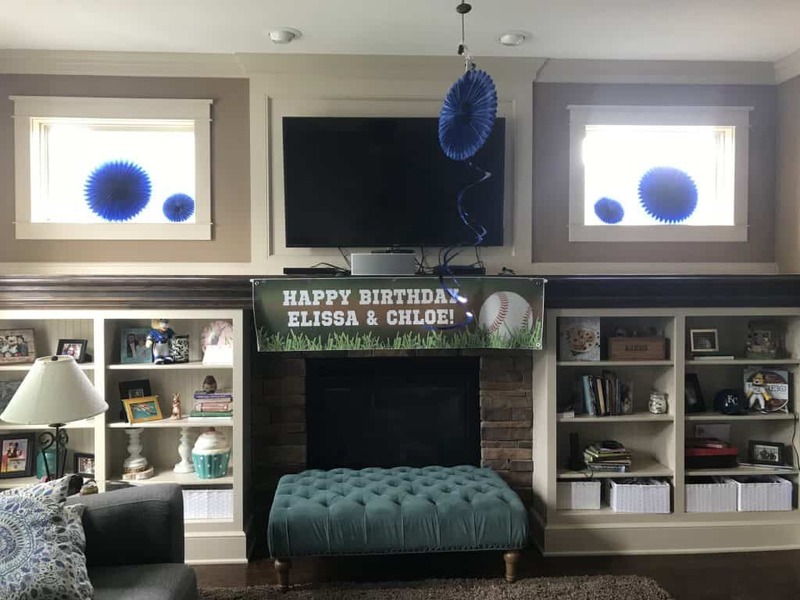 If you like our Baseball Themed Birthday Party Ideas, you are going to like our Red, White, and Blue American Themed party that we had last year! We wanted to stick to items that you would find at a Baseball Park. We left out peanuts just in case any kids had extreme allergies. All of our decorations came from BirthdayInABox.com. Ordering from their website is easy. We loved everything we got. Being able to not have to leave the morning of the party to pick up balloons was a great time saver. So was picking all of decor online and having it shipped to our house. We went and received their decor! The Easy decoration kids were SUPER easy and looked really cute around our house! It was easy and simple! 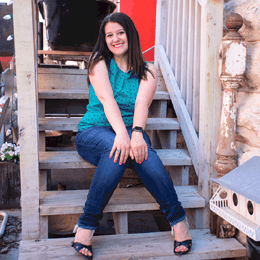 Easy Blue Decor Decoration Kit: Super easy to just hang up around the house! Makes your house instantly festive! Helium Tank with lots of balloons! We filled them up an hour before the party so they would stay up for the evening and they did! Our foil balloons we hung up are still flowing on our ceiling after two weeks! Baseball MLB Cups: The kids used these to collect their Piñata candy! The Adorable Personalized sign also was a great centerpiece to the party. 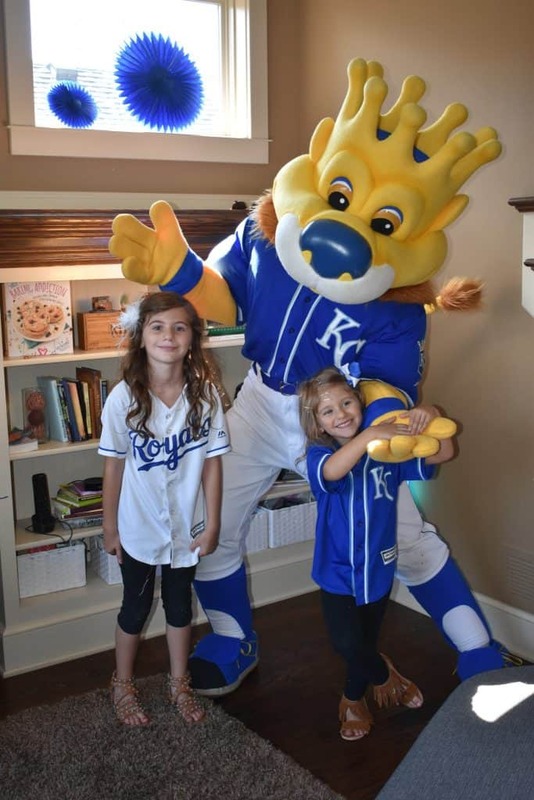 Mascot Attendance: We invited our local MLB mascot to surprise our Birthday Girls and our guests! This was all the entertainment that we needed! We did photo opportunities, signings, and he even sang Happy Birthday with all of us! 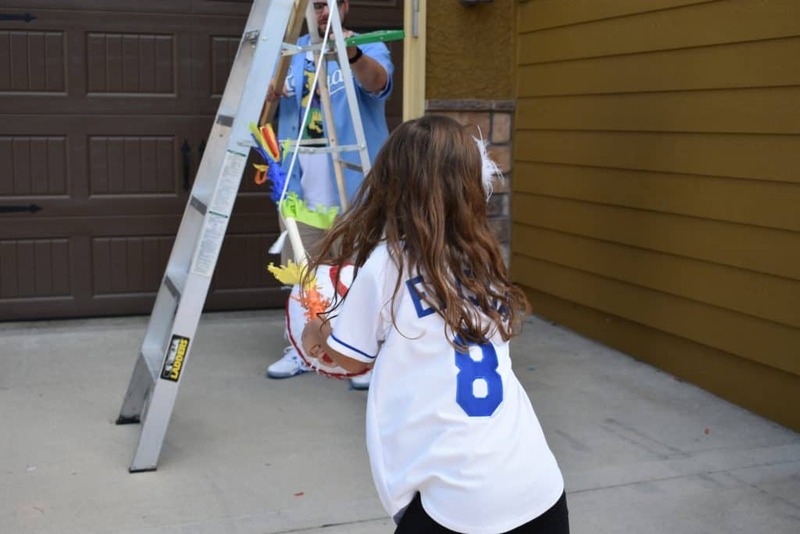 Baseball Piñata Kit: from Birthday in a Box: We do a Piñata for every birthday. It is easy, it is fun, and the kids all get to go home with candy! We thought it was be amazing to get color changing custom cups to use for their party! These served more than one purpose. We got the cups for the party and drew a lion with Baseball bats on it. THEN we also used them for our family 4th of July party and took them to a Kansas City baseball game to watch the amazing firework show from a suite. These cups were sponsored by AnyPromo.com. They are great for fundraisers, large parties, and more! They have been a huge hit. You did a great job on this themed birthday party. I especially liked the baseball cupcakes!! Pinatas are so much fun-but can honestly say this is the first I heard of one used in a birthday party–perfect!